The Winnipeg Jets finish a two-game road trip and complete their pre-all-star schedule tonight against the Dallas Stars…The Jets beat the Nashville Predators 5-1 on Thursday…The Jets are off from the player and all-star breaks from Jan. 20-27…Winnipeg’s next action is Jan. 28 in Philadelphia against the Flyers. The Jets are 13-8-0 on the road this season…Thursday’s win ended a two-game road losing streak and improved the Jets to 9-3-0 in their past 12 road games…Winnipeg hasn’t lost three consecutive road games in regulation since Dec. 10-20/16…Blake Wheeler leads the Jets in scoring on the road this season with 22 points (3G, 19A) in 21 games, while Patrik Laine has 16 goals in 21 games…Brendan Lemieux has scored all five of his goals this season on the road, including two on Thursday. After allowing a power play goal in six consecutive games, the Jets are a perfect 12-for-12 on the penalty kill in their past three games, including going 4-for-4 on Thursday against Nashville…The Jets are 10-5-0 this season when their opponent has four power play opportunities or more in a game and are 84.9% on the penalty kill in those 15 games…On three occasions this season the Jets have given their opponents six or more power play opportunities in a game and Winnipeg is a perfect 21-for-21 on the penalty kill in those games. The Jets are on a four-game winning streak, which is the third time this season Winnipeg has had a winning streak of four games or more…A win tonight would match the Jets longest winning streak of the season of five games, which they did from Dec. 9-16…On the flip side, the Jets have lost consecutive games just twice this season…Winnipeg has scored four goals or more in all four games during the winning streak and in six of their past seven games…Five members of the Jets are averaging a point per game or better in the past seven games, led by Blake Wheeler’s 10 points. The Jets finish a stretch of nine games (6-2-0) in 16 days tonight leading into the player and all-star break from Jan. 20-27…After the all-star break, the Jets also have a busy schedule with 11 games in 20 days. The Jets are 10-6-0 against Central Division teams this season…Since the start of the 2016-17 season, the Jets are 44-23-4 against Central Division teams, which is first in the NHL…In that same time frame, Blake Wheeler leads all NHLers in scoring against the Central Division with 91 points (27G, 64A) in 71 games, while Mark Scheifele is second with 84 points (34G, 50A) in 63 games. Brendan Lemieux scored twice on Thursday for his second multi-goal game of the season…His two multi-goal games are the two multi-point games of his career…The defence pairing of Sami Niku and Joe Morrow each had two assists against Nashville for their first multi-point games of the season…It was Niku’s first career multi-point game, while it was Morrow’s first multi-point game since Feb. 3/18 when he was with the Montreal Canadiens. Rookie Mason Appleton scored his second career goal on Thursday, which stood up to be his first career game-winning goal…In 95 career games in the AHL with the Manitoba Moose, 10 of Appleton’s 30 goals are game-winning goals, including four of eight goals this season. In seven games since Jan. 6, goaltender Connor Hellebuyck and Laurent Brossoit have combined to go an NHL-best 6-1-0 with a 2.12 goals-against average and .937 save percentage…Hellebuyck is 4-0 with a 2.28 GAA and .925 save percentage, while Brossoit is 2-0-0 with a 1.50 GAA and .962 save percentage…They have stopped 30 or more shots in four of the seven games and turned away 80 of 82 shots in the past two games. Jets forwards Blake Wheeler and Mark Scheifele have been selected to represent the Jets as members of the Central Division team at the 2019 NHL All-Star Game…Wheeler, who is making his second consecutive all-star appearance, leads the Jets in points (60) and also leads the Jets and ranks tied for second in the NHL in assists (51)…Scheifele is making his first all-star appearance…He is tied for first on the Jets in goals (25) and is second in assists (33) and points (58)…He is also in the top 15 in the NHL in goals and points…Head coach Paul Maurice has been selected as the head coach of the Central Division team, based on the Jets being in first place in the Central Division at the midway point of the season. Mark Scheifele and Patrik Laine share the team lead with 25 goals, which is the most a Jets player has scored in a season before the all-star break since relocation…Blake Wheeler’s 51 assists is the most a player has notched before the all-star break in franchise history and his 60 points are the most by a player since relocation…Wheeler is the only player in franchise history to be averaging more than an assist per game heading into the all-star break and his 1.28 points per game is second…Schefiele’s plus-18 rating is currently tied for a franchise record for best plus-minus rating before the all-star break. 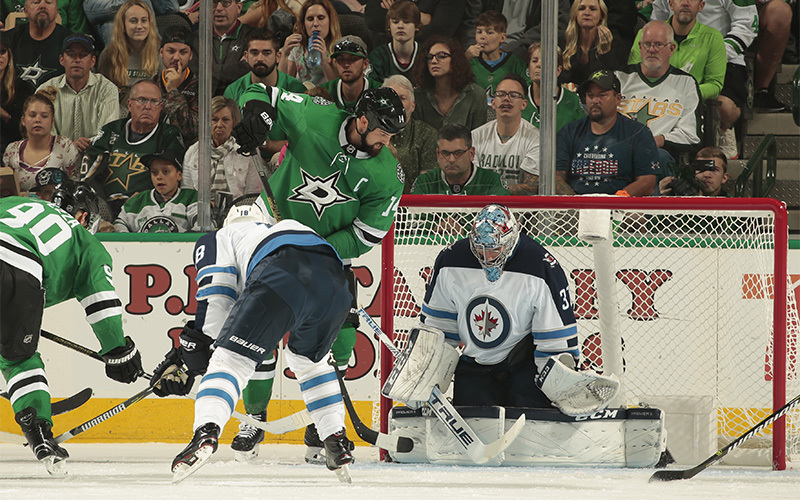 The Jets have won nine of their last 10 games against the Stars, including 3-1-0 in Dallas. Winnipeg is 6-for-16 (33.3%) on the power play in their past six games against Dallas. The Jets are 16-9-1 against the Stars since the franchise moved to Winnipeg in 2011. The Jets have scored at least four goals in nine of their past 10 games against Dallas, outscoring the Stars 45-21 in the 10 games. Blake Wheeler leads the Jets in career scoring against the Stars with 33 points (8G, 25A) in 28 career games, while Mark Scheifele has 28 points (13G, 15A) in 23 career games against Dallas. Goaltender Connor Hellebuyck is 7-2-1 in nine career starts against the Stars, with a 2.09 goals-against average and .931 save percentage. Jets defenceman Joe Morrow played nine game in the Stars organization for the Texas Stars during the 2012-13 season before being traded to the Boston Bruins in the trade in which the Stars acquired Tyler Seguin. Dallas’ Jamie Benn and Winnipeg’s Tyler Myers were teammates on the Kelowna Rockets (WHL) from 2007 to 2009. Stars’ Tyler Seguin played with Nikolaj Ehlers during the 2012-13 lock-out shortened season with the EHC Biel-Bienne hockey club in Switzerland. Scheifele played with the Stars’ Brett Ritchie for Canada at the 2011 U-18 World Championship and 2013 World Junior Championship. Winnipeg’s Patrik Laine played with Dallas’ Esa Lindell for Finland at the 2016 World Cup of Hockey and 2016 World Championship. Jets’ Laine and Sami Niku and Stars forward Roope Hintz won a gold medal playing together for Finland at the 2016 World Junior Championship.